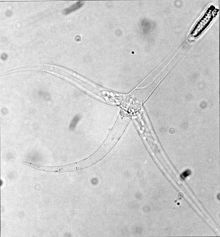 Triactinomyxon stage of Myxobolus cerebralis. ^ Štolc, A. Actinomyxidies, nouveau groupe de Mesozoaires parent des Myxosporidies. Bull. Int. L'Acad. Sci. Bohème. 1899, 12: 1–12. ^ Edwin Lanfranco. A phylogenetic classification of organisms other than animals (PDF). Diversity of Non-animal Organisms. 2007: 1–39. ^ J. Zrzavy & V. Hypsa. Myxozoa, Polypodium, and the origin of the Bilateria: The phylogenetic position of "Endocnidozoa" in light of the rediscovery of Buddenbrockia. Cladistics. April 2003, 19 (2): 164. doi:10.1111/j.1096-0031.2003sampled+.tb00305.x (不活跃 2010-03-17). ^ C. L. Anderson, E. U. Canning & B. Okamura. A triploblast origin for Myxozoa?. Nature. March 1999, 392 (6674): 346–347. doi:10.1038/32801. ^ Kent, M. L., Margolis, L. & Corliss, J.O. The demise of a class of protists: taxonomic and nomenclatural revisions proposed for the protist phylum Myxozoa Grasse, 1970. Canadian Journal of Zoology. 1994, 72 (5): 932–937.